Within the framework of the G20 in 2018, the Women20 (W20) presented its work agenda in Buenos Aires. The group created three years ago aims to promote gender justice in the commitments assumed by the forum and presents among its specific dimensions the labour and financial inclusion of women. As the McKinsey Global Institute report notes, in addition to empowering excluded women, in a gap-free world global GDP could increase by 26%, $28 trillion dollars, by 2025. Even in a second scenario without perfect equity but where all countries equal the best in their region, could be added for the same year $11 trillion (11%) to the Global GDP. There is also a positive correlation between the financial performance of corporations and the gender diversity in their boards and senior management. Specifically, it is estimated that companies with at least one woman in top management have a 44% higher return on capital, as well as better employee retention, among other benefits. However, despite progress on financial inclusion, the gender gap in access was the only dimension that did not show progress in the World Bank's 2011 and 2014 studies. A more recent report by the Global Banking Alliance for Women, based in 18 countries, indicates that customer growth rates, disbursed credit and deposits have been higher for women. However, the banks' portfolios surveyed still reflect 65% of customers, 81% of lending volume and 76% of male deposits. It is essential to understand the relationship between the dimensions of financial inclusion and the inclusion of women in leadership positions in financial institutions. It is not enough just to point out the benefits to the economy, the banks or the fact that women are empirically better clients than men. The underlying question is: Who is responsible for providing financial services to women? 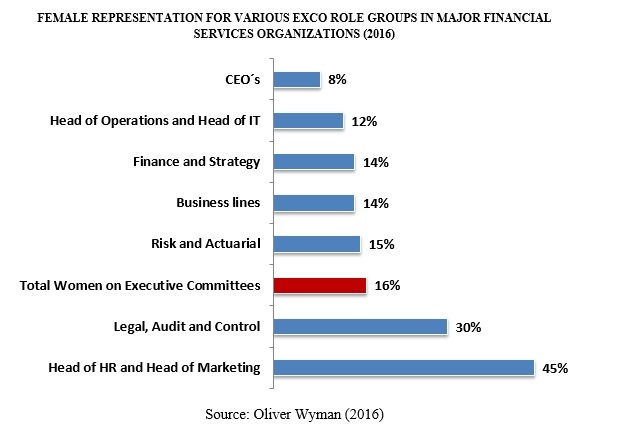 The report "Women in Financial Services 2016" by consultant Oliver Wyman is emphatic in this regard. Over nearly 400 financial institutions in 32 countries, women's participation in executive committees was only 16 per cent. Following the average growth in the 2003, 2008, 2013 and 2016 surveys, a 30% female participation in the executive committees would be reached by 2048. To make matters worse, these data disguise variations by function. While almost half of the Human Resources and Marketing managers in financial institutions are women, only 8% of CEOs are women. As expected, an analysis of the work flow chart shows a better representation in lower categories of the pyramid, with a majority of women in support staff positions and absolute minorities in executive and managerial positions. Another dimension that denotes the critical aspect of women's unequal role in the leadership of financial institutions arises when analysing entry, exit and promotion rates by category. In contrast to the general pyramid of the labour market, where asymmetries are found, when studying only financial institutions there are fewer women promoted, fewer women hired and more women leaving in all the work positions of the organization chart. We live in a financial world where only 147 economic groups control more than 40% of the global corporate system and 75% of these are banks. In terms of amounts, only 28 financial giants manage assets for an average of $1.8 trillion dollars per entity, adding up to approximately 50 trillion. To measure the terrifying relevance implied by these guarisms, by 2016, the product of the United States was $18 trillion in current dollars. Brazil's was $1.8 trillion and Argentina produced just $545 billion. That corresponding to everything produced on the planet amounted to $75.5 trillion dollars. In short, 28 financial giants manage assets equivalent to 65% of the global economy, far surpassing many nations in terms of product and economic power. Changing the way we think and execute traditional finance is much more than a utopian or romantic battle that should inevitably be left to activists. Changing finances is therefore a fundamental step towards changing our economic system and promoting labour and gender financial inclusion are not isolated objectives. Seeking equity within financial institutions is not only a pressing moral and social issue, it is also a critical economic challenge because looking at the numbers, there is no lack of truth in affirming that changing finances as we know them is, indeed, changing the world.